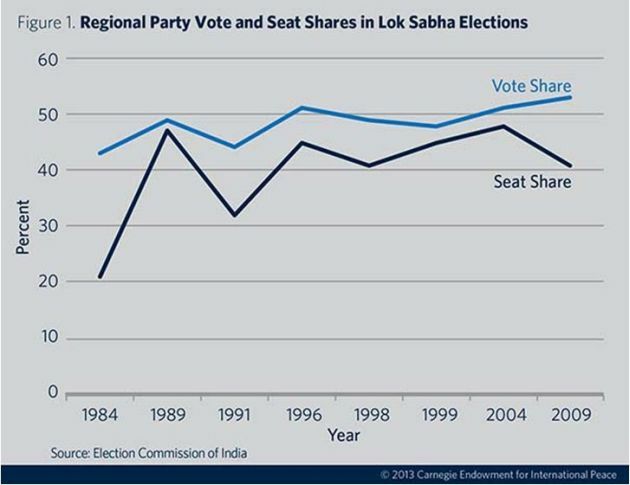 The increasingly fragmented vote has affected the share of seats won by regional parties in Lok Sabha elections. At present, regional parties occupy 41 percent of the seats—the same share they held in 1998. This is actually a decline from the two previous election cycles. 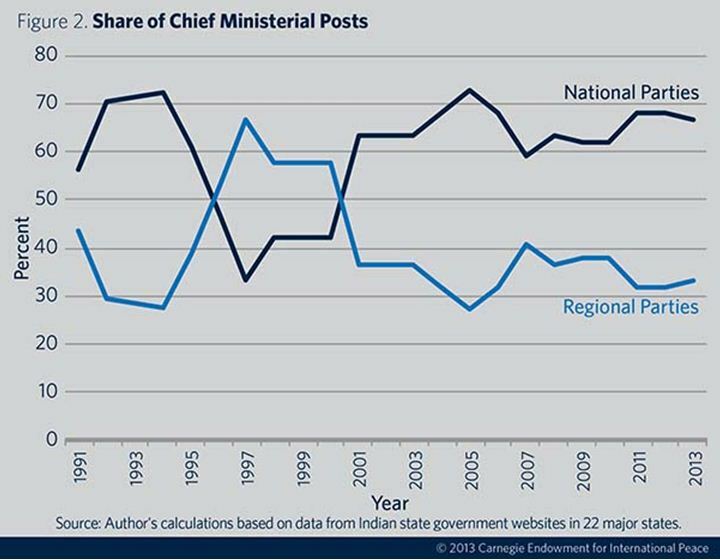 Regional parties’ vote share reached its highest level in 2009 (53 percent), but the share of seats allocated to regional parties declined because of fragmentation , suggesting that the proliferation of regional parties risks cannibalizing the “non-national party” vote share. Currently, chief ministers from the Congress or the BJP call the shots in two-thirds of the largest states—fourteen of 22 to be exact—while regional parties control one-third. In the late 1990s, the numbers were completely reversed. Regional parties’ control over states peaked in 1997 and has been on the downswing ever since. Regional parties have broken the stranglehold of the national parties and, in so doing, have helped usher in a semblance of competitive federalism. Yet regional parties are not unique in offering “hope.” Although there are several notable, long-serving state leaders from regional formations, a number of chief ministers from national parties have also apparently connected with voters in ways that have arguably been both good for governance and electorally rewarding. For instance, two long-serving BJP chief ministers—Raman Singh of Chhattisgarh (in office for nine years) and Shivraj Singh Chouhan of Madhya Pradesh (seven years)—are tipped to win reelection once again this December. Voters have repeatedly rewarded both national party leaders for engineering economic turnarounds in two chronically poor states.